For those who are not drive space intensive, the 30 Gigs of storage that you get from a basic $5 G Suite account may be sufficient for your business needs. For us as a digital marketing agency that is often focused both on corporate video and video animation, we are power users in the hard drive department. By purchasing five or more domain seats (think five separate email addresses) on our domain at G Suite and upgrading to the Business level, we qualify for unlimited online storage at Google Drive. Apparently, that “unlimited” technically means 150TB of Google Drive storage – which for us may as well be unlimited storage. Right now we have a Linux file server with two 8TB hard drives mirrored to each other. While that mirroring does help to prevent data loss in the event of drive failure, we remain at risk if there is a flood, fire or the server gets stolen – because there are no other backups. It’s difficult, expensive and time consuming to implement an additional offsite backup plan that involves multiple terabytes of photo, video, animation and design files – and until now we have simply been bearing the risk. When we have completed uploading all of our data to Google Drive, we will have an essentially unlimited and silent file server that takes up no space in our office. We have also transferred the responsibility of long term data storage to Google – and can always make duplicates of data locally if we really want to. This policy is by no means risk-free. But it’s certainly less risky than a single physical file server half hidden behind a desk in our office. I don’t think Google Drive’s search functionality is perfect, but compared with the files on our largely unsearchable Linux server, it’s outstanding. For example, we have a large number of titled and keyworded photo files that generate income from multiple stock photo agencies. With our old Linux file system, it was not possible to search for files based on their keywords embedded into the jpeg file. Not so with Google Drive, which I tested today and confirm that it searches based on the IPTC Photo Metadata Standard. Of course, it searches inside standard documents too – but it’s important for us that Google Drive is coming close to being an effective digital asset manager in its own right. It’s probably also only going to improve over time as Google rolls out more advanced search features in the background. Everyone gets too much spam and sadly, from a domain level, there really is not that much one can do about eliminating this modern-day curse. On our mail server, which is based at a leading ISP, we can modify the anti-spam sensitivity and correspondingly reduce spam finding its way into inboxes on any domain. However, increasing the server’s sensitivity to spam correspondingly increases the possibility of an important email being flagged as a false positive. I’d far rather have to deal with spam on a daily basis than ignore a really important client email that’s been mistakenly moved to a spam trap. However, anyone who has a Gmail account will notice that somehow Google manages to keep spam under control. It appears that Google is just much better at controlling spam. I’m not exactly sure how Google does this, but I just always advise those who are really frustrated with large amounts of spam to implement Google’s G Suite and bid the bulk of spam farewell. Our G Suite implementation will cost us about $600 a year for the whole upgraded Business service with five seats. That provides us with “unlimited” file server hosting and all other G Suite services too. Or put another way, that’s basically the cost of one entry level 4 bay NAS server a year without the required hard drives. It’s not free, but it’s certainly not expensive when considering less secure local alternatives. G Suite is device agnostic. For computers, we run an all Apple office – but use Android-based phones and tablets and all these devices work seamlessly with G Suite. Also if a device is lost, stolen or confiscated by the state (only laugh at this if you know exactly what your staff are doing on your office computers) you don’t run the risk of losing your business. Essentially the device itself becomes less important when all of the vital data and work files are safely located online. Your company server and files are available anywhere at any time regardless of where you may be located in the world. Sure, you can set up all kinds of technical wizardry to open ports to connect your local file server to the net – but odds are there are hours of frustration and quite few bills between you and achieving a half-adequate solution. Sharing a large file from Google Drive is extremely simple and Google easily provides all of the necessary permission settings that may be required. Sharing a large file from a local file server basically involves locating the file first and then uploading it to some kind of server or cloud service anyway. So if you already store your files in Google Drive, it saves time and resources when you need to share with clients later on. What appears to be missing from G Suite is an off-the-shelf project management, or at the very least, an assignable task management system. Such a system does not appear to be available yet without having to purchase a third party monthly subscription-based application service. We feel that Google could make G Suite even more valuable if it spent some time upgrading the personal tasks system into a more company-wide task allocation and project management tool. It really is halfway there and just needs better sharing and notification integration. 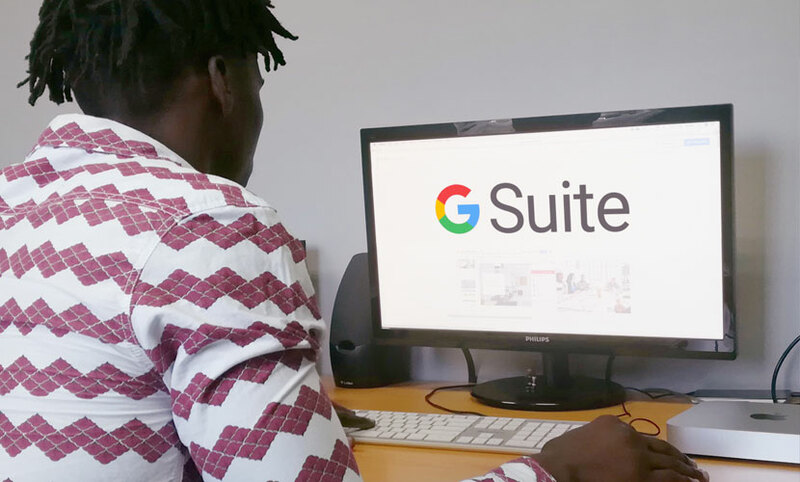 For us, researching why other companies have switched to using G Suite has not revealed anything important that we can further benefit from. What a lot of other small business bloggers and vloggers find important is simply not important for us. It’s easy and far more cost-effective to set up an additional domain email from a traditional ISP than it is to do the same at Google. It is much easier to configure on most devices though – so if you don’t know your POP from your IMAP, it’s likely that G Suite does provide an advantage from that perspective. Google Docs is not hugely important for us yet and perhaps never will be. It essentially performs the same function as storing an Apple Pages file on Google Drive and allowing your team to collaborate on it. It’s no killer app for us. However, Google Drive and its “unlimited” offering does represent that killer app that steals the show. It’s not going to be easy getting all of our data up there from South Africa, but the service is already proving itself to have important advantages over the technology we have been using before.